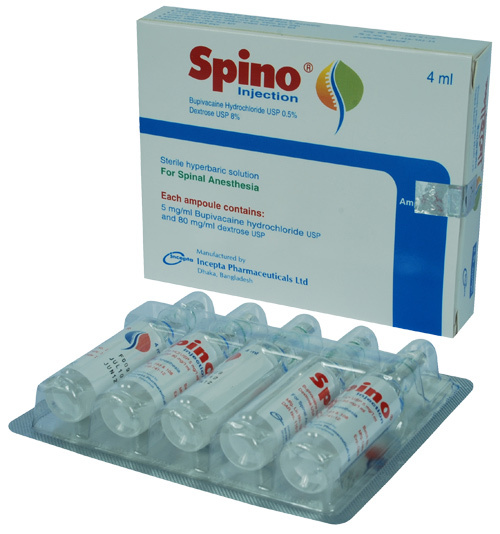 Spino Injection: A sterile, hyperbaric solution which is clear, colorless and particle-free contains 5 mg/mL Bupivacaine hydrochloride (0.5% w/v) and 80 mg/mL dextrose (8% w/v) solution. Bupivacaine is a long acting local anesthetic of the amide type. Bupivacaine spinal 5 mg/ml is a sterile non-glucose containing solution. Bupivacaine spinal has a rapid onset of action. The duration of analgesia is 3-5 hours in the lower thoracic and lumbar segments, which makes Bupivacaine spinal especially suitable for long lasting procedures in the lower limbs. The muscular relaxation of the lower limbs is profound, and lasts 3-4 hours, being somewhat shorter than the duration of the sensory blockade. The circulatory effects of Bupivacaine spinal are similar or less than those seen with other spinal agents. Bupivacaine spinal is well tolerated by all tissues with which it comes in contact. Bupivacaine has a pKa of 8.1 and is extensively bound to plasma proteins (95%). Bupivacaine exhibits a high degree of lipid solubility with an oil/water partition coefficient of 27.5. These factors contribute to its prolonged duration of action. The maximum plasma concentration is approximately 0.4 mg/L for every 100 mg injected, this is due to slow absorption from the subarachnoid space and the small dose required for spinal anesthesia. This means that even the maximum recommended dose (20 mg) would result in plasma levels of less than 0.1 mg/L. • Bupivacaine is indicated for lower abdominal surgery (including Caesarean section), urological and lower limb, including hip surgery, lasting 1.5 to 3 hours. • Bupivacaine are indicated for intrathecal (subarachnoid, spinal) anesthesia for surgical and obstetrical procedures. • Bupivacaine produces motor blockade of the abdominal muscles makes the solution suitable for performance of abdominal surgery lasting 1.5-2 hours. The duration of motor blockade does not exceed the duration of analgesia. The following dosage recommendations should be regarded as a guide for use in the average adult. The patient's physical status and concomitant medication should be considered when deciding the dose, and the lowest dose required for adequate anesthesia should be used. Duration varies with dose, while segmental spread may be difficult to predict, especially with the isobaric (plain) solution. The dose should be reduced in the elderly and in patients in the late stages of pregnancy. The spread of anesthesia obtained with Bupivacaine is dependent on several factors, the most important being volume of solution injected, position of patient and rate of injection. • 1.5-4 mL Bupivacaine (7.5-20 mg Bupivacaine hydrochloride). • When 3 mL Bupivacaine was injected into the L3 - L4 interspace and patients were kept in the sitting position for 2 minutes before being placed supine, blockade spread to the T7 - T10 segment. When a similar injection was made in patients in the lateral position who were then immediately placed supine, blockade spread to the T4 - T7 segment. Bupivacaine may be used in children. One of the differences between small children and adults is a relatively high CSF volume in infants and neonates, requiring a relatively larger dose/kg to produce the same level of block as compared to adults. The adverse reaction profile for Bupivacaine is similar to those for other long acting local anesthetics administered intrathecally. Adverse reactions caused by the drug per se are difficult to distinguish from the physiological effects of the nerve block (e.g. decrease in blood pressure, bradycardia, temporary urinary retention), events caused directly (e.g. nerve trauma) or indirectly (e.g. epidural abscess) by the needle puncture or events associated to cerebrospinal leakage (eg. postdural puncture headache). 1.When any local anesthetic agent is used, resuscitative equipment and agents, including oxygen, should be immediately available in order to manage possible adverse reactions involving the cardiovascular, respiratory or central nervous systems. 2. The safety and effectiveness of Bupivacaine depend on proper dosage, correct technique and adequate precautions. Standard textbooks should be consulted for specific techniques and precautions for spinal anesthetic procedures. If signs of acute systemic toxicity or total spinal block appear, injection of the local anesthetic should be stopped immediately. 3. Patients in poor general condition due to ageing or other compromising factors such as partial or complete heart conduction block, advanced liver or renal dysfunction require special attention although regional anesthesia may be the optimal choice for surgery in these patients. 4. The possibility of hypotension and bradycardia following epidural or subarachnoid blockade should be anticipated and appropriate precautions taken, including the prior establishment of an intravenous line and the availability of vasopressor agents and oxygen. Hypotension is common in patients with hypovolaemia due to haemorrhage or dehydration and in those with aortocaval occlusion due to abdominal tumours or the pregnant uterus in late pregnancy. Hypotension is poorly tolerated by patients with coronary or cerebrovascular disease. 5. Bupivacaine should be used with caution in patients with known medicine sensitivities. 6. Bupivacaine should be used with caution in patients with genetic predisposition to malignant hyperthermia as the safety of amide local anesthetic agents in these patients has not been fully established. A standard protocol for the management of malignant hyperthermia should be available. 7. Spinal anesthesia can be unpredictable and very high blocks are sometimes encountered with paralysis of the intercostal muscles, and even the diaphragm, especially in pregnancy. On rare occasions it will be necessary to assist or control ventilation. 8. Chronic neurological disorders, such as multiple sclerosis, hemiplegia due to stroke etc. are not thought to be adversely affected by spinal anesthesia, but call for caution. 9. There is an increased risk for high or total spinal blockade in the elderly and in patients in the late stages of pregnancy. The dose should therefore be reduced in these patients (see DOSAGE AND ADMINISRATION). With recommended doses, Bupivacaine enters breast milk in such small quantities that there is generally no risk of affecting the breast-fed child. At maternal serum levels of up to 0.45 µg/mL produced by the epidural use of Bupivacaine for vaginal delivery, Bupivacaine could not be detected in breast milk during the first 24 hours after delivery (detection limit 0.02 µg/mL).